The iPhone 5 might be 18% thinner and 20% lighter, but the launch will be just as big as ever. There’s something rather peculiar about Apple (Nasdaq: AAPL) product launches nowadays. Thanks to a steady stream of supply-chain leaks and the never-ending rumor mill, careful watchers always have a very good idea of what to expect. That rang true when Apple unveiled its iPhone 5 to the world. Just about every aspect of the event went according to expectations, and there really weren’t any big surprises, for better or for worse. That being said, just because Apple didn’t surprise everyone, that definitely doesn’t mean it disappointed anyone. On the contrary, with analysts already expecting the device to see one of the biggest upgrade cycles in the history of man based in part on those same rumours as well as pent-up demand, coming in on target is hardly a bad thing. The physical casing has been redesigned, and while it looks similar, there are some important differences between the iPhone 5 and its predecessors. Apple has managed to slim down the device by 18%, from 9.3 millimeters to 7.6 millimeters, while also losing 20% of its weight, from 140 grams to 112 grams. The body is made out of glass and aluminum, the same grade used in its notebooks. Apple didn’t mention it by name, but it is using in-cell technology to slim down the device. That involves integrating the touch sensors directly into the display panel and eliminating the need for a separate layer. The display is now taller, measuring 4 inches diagonally, while keeping the same width and changing the aspect ratio to 16:9. The resolution is 1136 x 640, keeping the same Retina pixel density. The iPhone 5 comes with 4G LTE speeds, and according to Fairfax, Apple have confirmed the new phone will work on 4G networks in Australia including Telstra (ASX: TLS), Optus and Virgin Mobile. Battery life has been improved relative to the iPhone 4S, an amazing accomplishment considering how much more powerful the device is and LTE’s notoriety for battery drainage. This is particularly true considering the battery has roughly the same capacity, so those gains are the result of improvements in power consumption. The primary image sensor remains at 8 megapixels, but Apple has made it smaller as well as continued to refine the optics system. The company now uses sapphire crystal for the lens, and the camera shoots 40% faster thanks to the A6 chip. The front-facing FaceTime camera has been greatly improved, up to 1.2 megapixels, and is capable of 720p HD video. The iPhone 5 has an improved speaker design, and Apple has now introduced a new dock connector called “Lightning.” It’s a rather cheesy name that naturally goes hand in hand with its Thunderbolt connector. The original 30-pin dock connector has been around since 2003, and Lightning has just 8 pins. It’s also 80% smaller, all digital, and reversible so you can’t plug it in the wrong way. There’s naturally a $35 adapter available so you don’t have to trash all your third-party accessories. Apple is also releasing new earbuds, which it calls EarPods, that it says it’s been designing for three years. When can it be yours? 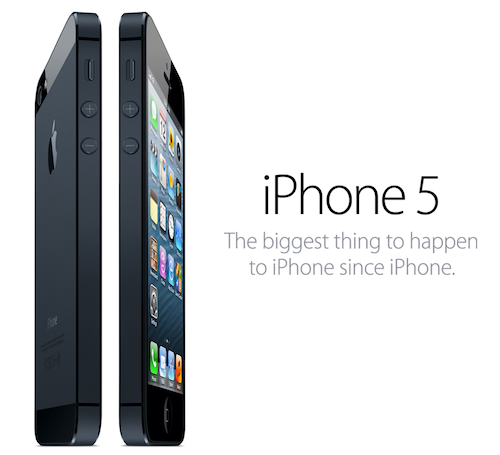 iPhone 5 is released here in Australia on September 21, with pre-orders starting as soon as this Friday. Last year, the iPhone 4S sold 4 million units on launch weekend. The iPhone 5 can probably move at least 6 million this time around.